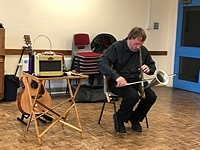 Click the links below to share in some of our recent activities in our Resource Centre. You'll find more photos from our popular trips and other events in our Main Photo Gallery. 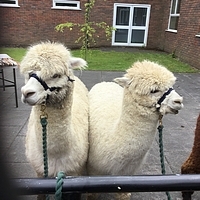 On Thursday 18th October 2018 Headway South Bucks held a special "Owl Event". To start the day everyone was able to enjoy a selection of Owl related activities. 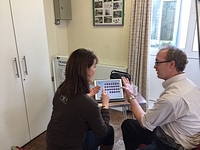 As you can see from the photos there was an Owl wordsearch and a selection of Owl adult art therapy. We made Owls from facecloths which were very popular as well as feather collage Owls. Our creativity was challenged by the Owl shaped biscuits that were available to decorate with icing before eating! Another popular activity was the Owl money banks which were decorated with porcelain pens. Scratch art and wooden Owl key rings were also on offer. After all this creativity we enjoyed a fish and chip lunch followed by a selection of yummy cakes! The highlight of the day was a visit from Colin Sutherland from Wings of Freedom. He came to talk to us and show us his beautiful birds. Firstly we met Bob, a Falcon, followed by Rocky the Barn Owl. 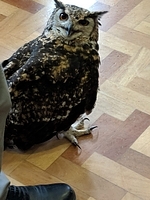 Possibly the most entertaining visitor was Norman, a European Eagle Owl who happily sat on the floor in the middle of the hall completely unfazed by us. Lastly we met Bert the baby Tawny Owl who everyone thought was very cute. As you can see from the photo gallery the Owls were very popular and a number of clients were delighted to be able to hold them. Finally everyone was given an Owl party bag containing Owl shaped Haribo sweets! 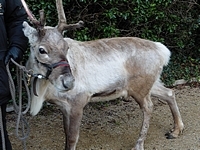 Reindeer day last year, Owls this year, I wonder who will come to visit HSB in 2019?? Watch this space! 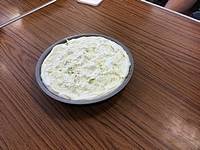 The clients and volunteers divided into 2 teams and made 2 Pies. Everyone was involved and we had lots of fun. They enjoyed eating the pies after lunch! 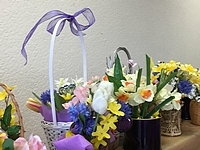 One of of our very talented volunteers, Carol, assisted with arranging Easter Baskets. The pictures speak for themselves. As you can see we did Digital Art with two clients. Jane came in and taught the clients how to do crocheting as well and then we carved pumpkins for Halloween. A busy Wednesday!!! Thursday 29th September was National Coffee Day, and as part of our Resource Centre activities a group visited the local Costa Coffee. Thursday 23rd July was National Hot Dog day and National Vanilla ice cream day so we decided to embrace this at Headway! Some of our clients helped prepare the onions for our hot dogs as well as some nice salad to go with them. Everyone enjoyed a lovely lunch followed by vanilla ice cream of course! Our Wednesday group enjoyed a pizza making session. Everyone made their own pizza which they then ate for lunch with a nice salad they had also prepared. We have had a busy time at HSB over the last few weeks with lots of new activities as well as some of our regular ones. One of the new activities is food preparation and you can see our yummy Rocky Road bars which we made on Rocky Road day! We enjoyed two new sports last month, Unihoc and Wheelchair Basketball. Both were thoroughly enjoyed. With some beautiful sweet peas which were kindly donated by our local florists we made some ice flower decorations. Frances came to lead us in another encaustic wax session which is always popular and we produced some lovely artwork. Last week we had some unexpected visitors, a few ducks! The female duck, as you can see, was bold enough to want to join us in the hall! Finally Chocolate day (July 7th) was enjoyed by all!